We try out Virgin Atlantic’s new afternoon tea! 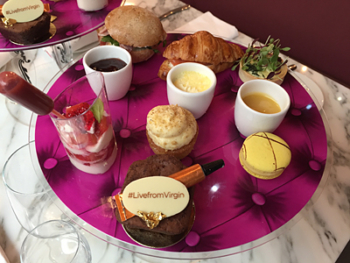 We try out Virgin’s new afternoon tea in the Clubhouse and in the air! This is the continuation of my report on my (Jamie’s) press trip to New York with Virgin Atlantic. Whilst Economy Delight does not usually come with Clubhouse access, I was allowed in to take a look at the new afternoon tea service and some other features. I also got to see the afternoon tea service for Upper Class passengers in the air. My Economy Delight seat review is here. It was my first time in the Clubhouse lounge and, following a tour by one of the meet and greet staff, I was very impressed with it. Rob reviewed the Clubhouse in full here if you want to learn more about it. Following introductions we were shown some of the new innovations that Virgin Atlantic are looking to roll out. Both machines offer good quality ‘proper’ coffee. The premium machine offers an espresso with the drink produced by hand pulling hot water over fresh coffee beans. As this piece of equipment is purely mechanical with no electrical parts it has already been approved and hopefully will be appearing on flights soon, most likely in the Upper and Premium class cabins. As a bonus, it will also be used to make espresso martinis for those who prefer something a little stronger. These certainly went down well with our group during the demonstration! 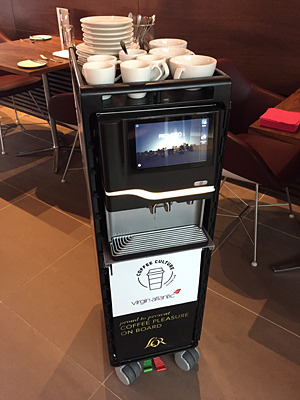 The standard coffee machine has a touch screen which can be used to create your coffee just the way you like it. Because it does have some electrical components, it is still awaiting approval to join the fleet. It should be available on flights from later in 2018. As you can see in the photographs, both machines are compact and manoeuvrable. However it is not clear at this stage whether they will be pushed down the aisle or left near the galley for you to help yourself. 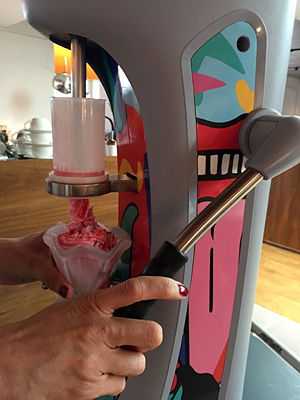 This is another mechanical kit whereby cylindrical containers of Walls ice cream are pushed through a nozzle to give it a soft and creamy texture. It comes in three flavours – strawberry, chocolate and vanilla. And as if that wasn’t enough, you have a choice of delicious, naughty toppings such as a chocolate flakes, glacier cherries or sugar sprinkles. 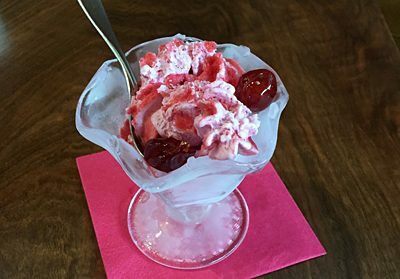 I had a bowl of strawberry ice cream with cherries. It was rather good even if it did constitute the first part of my breakfast that day. These dispensers will be trialled soon and will probably stay at the rear of the plane. Please form an orderly queue! A new afternoon tea service is being introduced both in the air and in the Clubhouse. It has been created by master pâtissier Eric Lanlard aka Cake Boy. Eric worked with the Roux brothers before setting up his own business in Battersea Reach. Channel 4 has produced two television series with him – Glamour Puds and Baking Mad with Eric Lanlard. Eric welcomed us to the area where he had set up his Clubhouse version of afternoon tea with a glass of Lanson Rosé Champagne and a big smile. He then proceeded to talk us through his enticing looking creation. Whilst some aspects of it are traditional – for example plain and fruit scones with strawberry preserve and clotted cream – Eric has infused it with a modern twist. There are smoked salmon mini croissants, savoury tarts and prosciutto rolls. All tasted fresh and delightful. Sweets include a macaroon, an Eton mess verrine (with strawberry coulis you inject before eating) and my favourite – a dark chocolate brownie that comes with an edible gold leaf and a tube of salted caramel sauce you squeeze on yourself. It was creative, fun, delicious, wonderfully presented and totally self indulgent. I loved it. Afternoon tea will be available in the Clubhouse between 3.00pm and 5.00pm. I did think this would be difficult to match or improve on in Upper Class, since it is obviously harder to store and serve products in the air. I was proved quite wrong later that day. Eric was on board our flight to prepare and serve his new Upper Class afternoon tea. We were invited down to the Upper Class bar to see him hand-finish some of the cakes. Having been so impressed with Erics new Clubhouse afternoon tea offering, I knew he had to do something special and he did not disappoint. It looked simply stunning. Upper Class afternoon tea has been designed to be served at the bar. The intention is to get passengers up to stretch their legs and create a pleasant social environment whilst you enjoy the delicious baking on offer. If this doesn’t appeal, you can still have it served at your seat. As you can see from the photos there was a wide variety of choices available. Fresh rolls and wraps included hot smoked salmon, falafel and red pepper houmous, roast beef, peppered pastrami, chicken caesar and greek feta salad. There were freshly baked sausage and cheese rolls, both of which smelled irresistible. Patisserie items included lemon and poppy seed cakes, red velvet cup cakes, passion fruit éclairs and of course macarons amongst others. And the classic warm scones were there too. If this was a true reflection of how afternoon tea will be served day-to-day when it is eventually rolled out then passengers are in for a treat. Considering all aspects of my trip, I found it encouraging to see the improvements which have already been made and the innovations Virgin Atlantic is attempting to deliver. We obviously need to see how these new products are actually delivered day to day. However, whether its a better cup of coffee, an ice cream for the kids or an indulgent new afternoon tea service for the seasoned upper class traveller, the intent is there to improve the travel experience for everyone. Now I need to work towards attaining enough Flying Club miles to fly Upper Class one day! 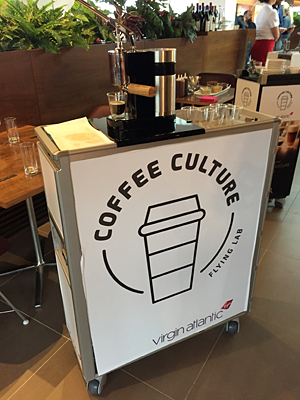 There is one article left in this series which will run at the weekend – a review of the Virgin Atlantic Clubhouse at New York JFK. OT: sorry I missed the Ethiopian news yesterday. How is Ethiopian airlines business class? Fairly well regarded. These are new Boeing 787 aircraft. It’s not Qatar / Emirates but certainly comparable with South African I believe.